This excerpt is from the dictation Life’s Purpose and the Divine Plan by the Queen of Light published in the 1970 Pearl of Wisdom Vol. 13 No. 3. How is it that man fails to recognize that he was originally created in the image and likeness of God, that he was originally endowed with virtue and purity of purpose? Now, simply because the individual has misconstrued purpose and lived according to the dictum of the carnal mind, does not in itself preclude the possibility of the divine existence. We are talking about two distinct phases of man’s existence: the eternal, or infinite phase, and the finite phase. The infinite phase has unlimited possibilities for soul expansion. But the finite phase also affords a certain freedom of expression. It manifests a God seekingness and a human seekingness. Out of this duality man must make his choices. By understanding that there is a supreme purpose and that that purpose can be known and served, man is better able to understand the design of the universe. He is more endowed with the capacity to utilize the power of his vision, of his hearing, and of the spiritual senses to precipitate higher causes. Nevertheless, through what has been called free will man can manifest any human quality he desires and lead a wholly selfish existence. Such an existence is bound to enervate the soul because of the very laws which separate the human consciousness from the divine. The moment an individual begins to serve himself, to determine that all that he does will be subject to the functions of the human ego, whether his own or another’s, without recognizing the needs of the Christ in every man and the purposes of the divine plan to be fulfilled, his creative endowment cannot help but be bound by the return of his own misqualified energy. The secret key to the fulfillment of individual purpose in God is to be found in the invocation of cosmic grace, in the invocation of faith in what has been called the invisible world. This world need not remain invisible. It has been called invisible because the senses have become inverted to gaze only upon the imperfection of the physical planes. Man has not recognized the perfection of the spiritual spheres. He has not recognized the perfection of his own God Presence. In fact, during centuries of embodiments he has not even known of the existence of that Presence. Now it is up to us, who have been endowed with an understanding of the law of the I AM, individualized in the Presence of every child of God, to unveil the higher purpose. From time immemorial the blind who have led the blind have succeeded in promoting forms of religion based on superstition that have assuaged human needs without actually supplying man with the basic laws of his own being that would lead to his freedom and self-mastery. 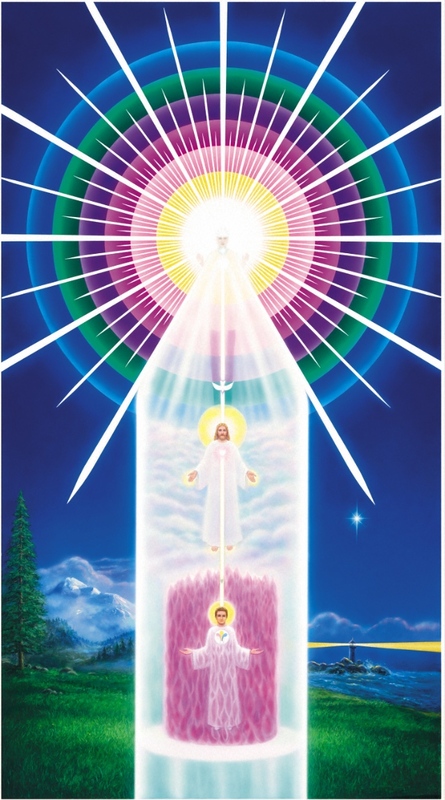 But in the Chart of the Presence revealed by the Brotherhood of Light, the manifestations of the God Self (the Higher Self), the Holy Christ Self, and the human or lower self are perceived as three who agree in one. Through meditation upon this trinity man recognizes, at last, that the human monad has the capacity, being at the opposite pole from the Divine Self, to obtain grace from the equipoise of the Christ, the Universal Mediator, and thus to manifest for all time, point by point, the magnificent facets of the law, ‘as above so below’. If man manifests below, he also manifests above. If he manifests above, he also manifests below. Therefore, he should understand that the physical self is the potter’s mold into which a tremendous outpouring of divine grace continuously flows. Thus the lower self is sent forth into the time span, into the human vector, to pose an opportunity for the Spirit to manifest and to complete the destiny of the individual lifestream.